Location: The ReCrafting Co., Santa Clara Ave. at Everett in Alameda. Cost: $50 Includes full class kit. Just bring scissors and a ruler! 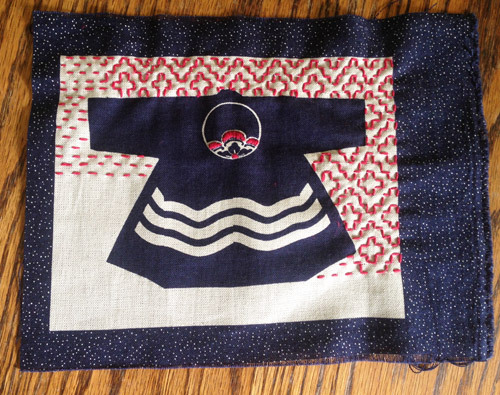 We’ll cover basic stitch technique, how to transfer a design onto fabric, and the little details such as turning corners, backstitching instead of tying knots, stitch length, and all the nitty gritty you may have been wondering about in your own sashiko practice. A kit will be provided with fabric, thread, needles, and a thimble. Just bring scissors for cutting thread and a ruler for measuring lines. If you have a project you’ve already started and would like some feedback or help getting it finished, bring it along. To reserve your spot contact Carol via email or call 925-360-3375. Maximum class size is 8. Students 12 years old or older, please. Want me to teach this class at your guild or local sewing shop? Let me know! Next Post Sashiko Needles – Which to buy?